I arrived in Bergen yesterday afternoon. It’s a lovely town, but not the sort of place with which I could fall in love. It’s a tourist haven. It feels like the outdoorsperson’s variant of a place like Bruges or the Cinque Terra. Overrun, locals outnumbered 7 to 1 (Bergen is a bit better in this regard, as the numbers in those other places are much worse, but it seems that it still is 100% dependent on tourism and isn’t otherwise self-sufficient). The harbor is filled with yachts, sailing ships, and at least one massive cruise boat (I’m awoken in the morning with blasts from its deck horns). The aged buildings along the wharf edges are beautiful, as are the green hills/mountains around the north, south, and east of the village. The sun, once more, isn’t set when I went to bed after 11pm, but I slept much better last night than the second night in Oslo. Today holds reading, writing, and perhaps a walk up a hill to get a view of the harbor. 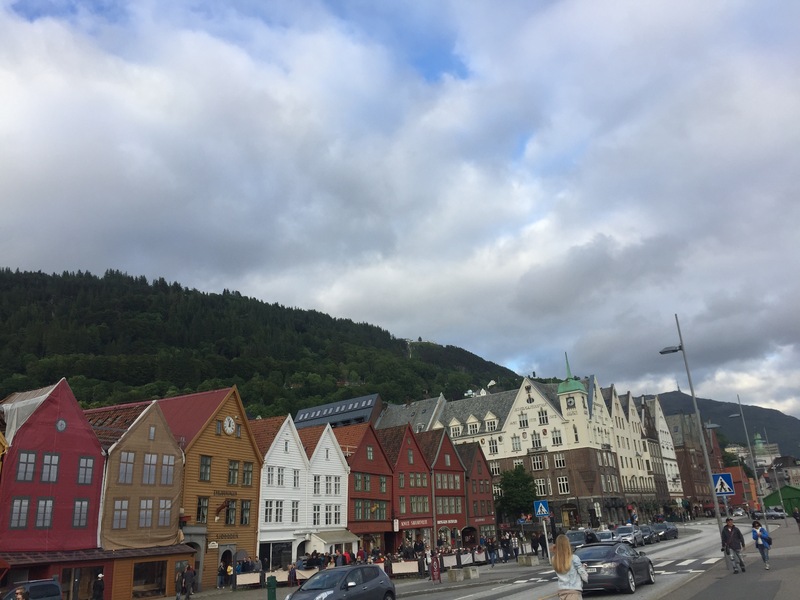 To be honest, though, I’m a bit dampened in my enthusiasm about Bergen in particular and Norway in general because of the costs associated with mere existence in this place. Here’s a warning about this place. There are relatively few places like this in the world for a budget traveler: one lives worse here, in a place with an exceptionally high standard of living, than one would in a place with far lower standards. Maybe it’s obvious, and I knew to some degree what I was getting myself into when I booked this trip. Things cost more. To live badly costs more. With coffee + croissant running around ten dollars per pop out here, eating full meals on a budget (even from grocery stores) is difficult. The hostels are pricier, even the merely so-so ones. So if you want to live well and spend less, go somewhere else. You’ve been warned. It would be cost effective, if you’re in a position to camp, to stock a supply of food at a grocery store and head into Norway’s open spaces to camp for free. I suppose I’m just not interested in that at this point, but if you are, it would be a good move. That said, the place is, as I said above, beautiful. It’s worth seeing, even if you can’t afford the fjord cruises, car rentals, and the like. I’m grateful for the opportunity. Tomorrow, it’s on to Berlin, my favorite place on Earth (so far). Bottom: Those buildings are definitely falling over. There are too many people here. Remember, you can always find this summer’s posts on this page, and don’t hesitate to click around to the rest of my site! 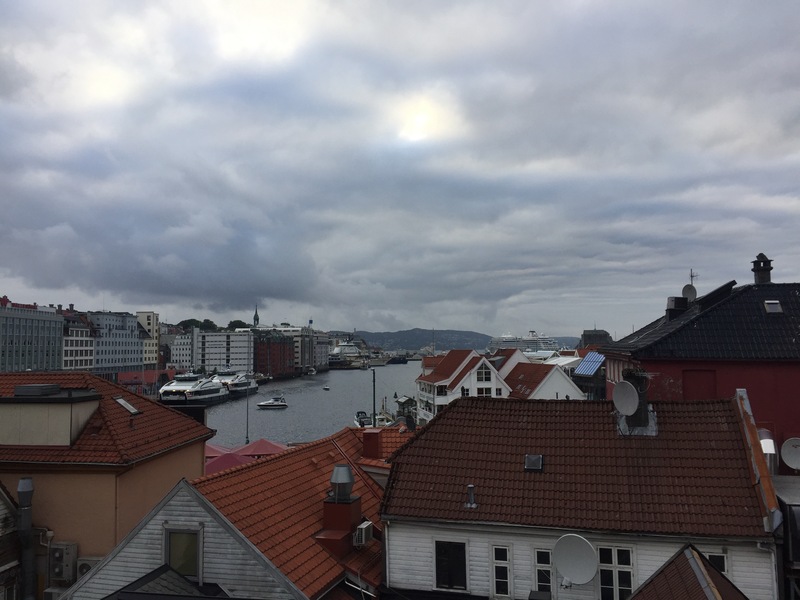 This entry was posted in Travelogue, Travelogue 2017, Travels and tagged bergen, budget, budget travel, eating on a budget, europe, Europe Trip, hostels, norway, travel, traveling, travelogue. Bookmark the permalink.